The point of living an active lifestyle, or incorporating exercise and other activities into your routine, is to be healthy. Exercise and sports have other benefits like helping to manage stress and anxiety, increased energy, and even improve your quality of sleep. Taking care of your body, particularly when it comes to injury, is just as important as the rest of your overall health. 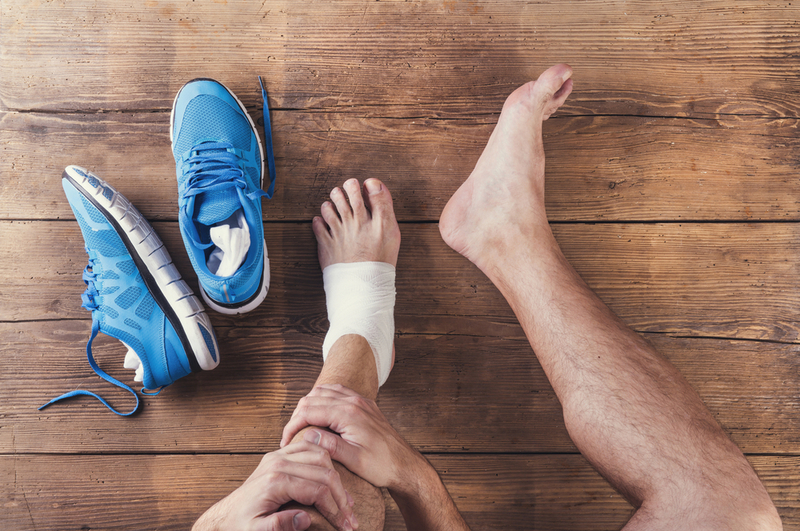 An active lifestyle can often lead to injury if you are not careful, so over the course of this article we will discuss some of the most common sports and exercise related injuries, signs of injury, and ways that you can prevent injury during your workout. Pushing yourself to do one more rep, run one extra quarter mile, or hold that plank for 10 seconds longer is an awesome thing, but not if it causes injury. Injury is something that can happen to any active person, and it doesn’t necessarily have to happen in the gym. You could be on a hike and twist an ankle, or pull a muscle running the bleachers at your local school. There are so many different types of injuries, most of which are considered common. One of the most common injuries among exercisers is pulling or straining a muscle.This specific type of injury generally occurs when the muscle suffers from overuse or fatigue. It is also possible to pull or strain a muscle by training and working out too much. Yes, it’s true; you can work out a little too much sometimes! For minor aches and pains, especially those associated with arthritis and joint pain, try SSLA Lifestyle’s Soothe Muscle & Joint Pain Relief Cream. This fast acting aloe-based cream has a silk smooth finish, and works to help eliminate the pain often associated with joints and overused muscles. Try Soothe today, found on the SSLA Lifestyle shop page. A few of the best ways to prevent these types of injury include stretching daily, and more importantly taking rest days. It can be hard to take a rest day, especially when using exercise as more than just a means of being fit. Taking the appropriate rest days for recovery as just as important as doing the actual exercise, so if you’re feeling strained take a day off to recover! Another common exercise and sports injury is shin splints. If you’ve ever experienced them before, you know they are most definitely not enjoyable. Shin splints are felt from the knee down to the bottom of the shin, and occur when the tissue around the shin becomes inflamed. Then, the muscle and tissue press against the bone during activity, causing the pain and inflammation. Shin splints are very common in sports outside of the gym, like ballet dancing, and those who run frequently often suffer from them. Luckily for those who may suffer from shin splints there are an array of solutions for relieving this pain: foam rolling, icing, elevation, and some basic over-the-counter pain medicine (like ibuprofen or advil) can help handle the pain. Straining your back is a big injury among those who work with weight, especially heavy weight. Many people already have somewhat weak muscles in their backs from sitting whether it be at work or at home. So, when it comes to hitting the gym, you can easily go too hard, heavy, or fast and strain your back. One of the best ways to avoid an injury like this, which can be severe, is to start slow. It makes sense that you would want to push yourself especially if you’ve had a particularly successful day with your back squat, but over-exerting yourself can lead to a serious strain injury and prevent you from working out in the future. Another tip is to focus on lifting with your legs and not with your back. You can also weave exercises into your routine to strengthen your back. Focus on working injury prevention into your routine, instead of worrying about treating them when they occur. Being proactive about possible injury is the number one way to prevent harming yourself when in the gym. Doing a proper warm-up session before a workout will help prepare your muscles and body for some conditioning, and prevent injury in the process. Cooling down after your sweat session and doing the proper stretches after a workout can also help prevent injury. Another way to prevent injury is to spend some serious time focusing on your form before getting deep into your routine. Often times improper form can cause injury, so starting your fitness journey with a focus on the proper techniques can benefit you so much in the long run. Taking care of your body from the inside out is key to living a healthy and active life. Listen to what your body tells you, even if it means taking a step back from your fitness routine and focusing on rest and healing.